He would deny it publicly, but Jackson Pollock owed much of his rhythmic, energetic style to Thomas Hart Benton. At first glance, Thomas Hart Benton (1889– 1975) and Jackson Pollock (1912–56) make an odd pair. Benton, the sophisticated son of a U.S. congressman from Missouri, attended private schools and spent his young adulthood wearing black capes while studying art in Paris. Pollock, the poor son of an alcoholic drifter, never graduated from high school and worked at a road camp before heading to New York to become an artist. Yet the bond of friendship between these two men not only deepened their individual lives but also altered the course of American art in the 20th century. 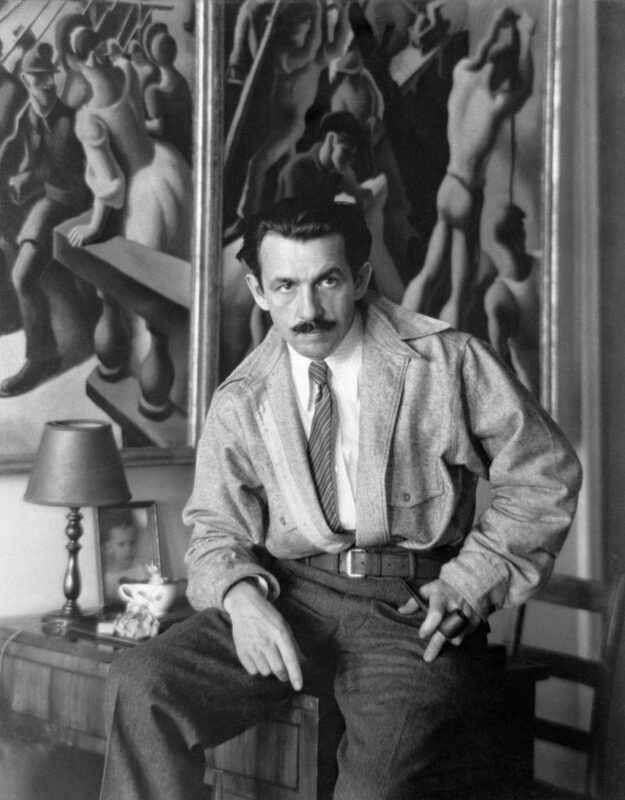 Without Thomas Hart Benton, there would be no Jackson Pollock. The two met in 1930 when Pollock, 18, enrolled in Benton’s Art Students League class in New York City. Pollock, not a naturally gifted artist, struggled to learn the techniques of the Old Masters that Benton taught. Still, the older artist liked Pollock and became a mentor and father figure to him— and Pollock grew to idolize Benton and adore his family, especially his fiery and maternal wife, Rita, who frequently cooked dinner for the impoverished young artist. Pollock, it seemed, couldn’t get enough of them. He spent many late evenings with the Bentons, babysat their young son, T.P., and vacationed with them in Martha’s Vineyard. 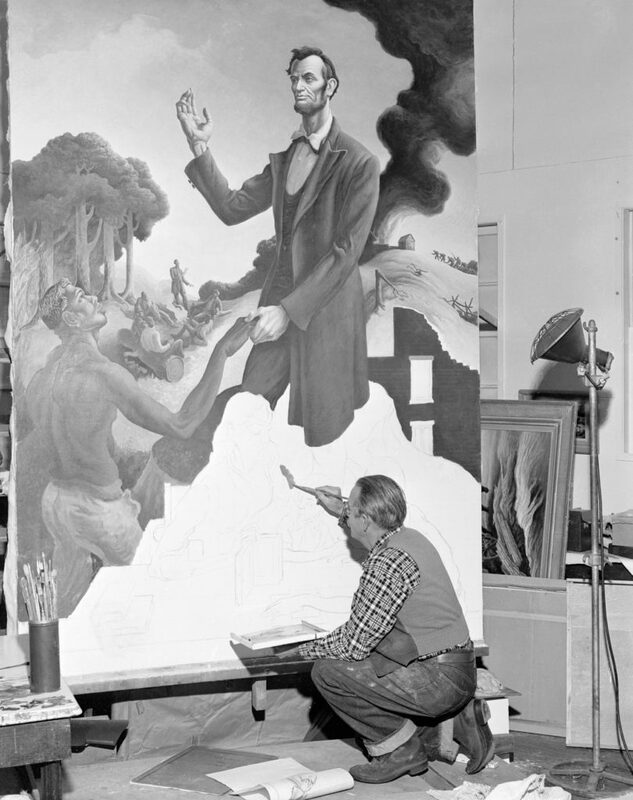 When Benton and Pollock initially crossed paths, Benton was virtually unknown, but he had just received his first major commission, a mural for the New School for Social Research called America Today. Several years before, Benton had taken a six-month trip across America and made hundreds of sketches of the people and scenes he’d encountered—farmers, strippers, boxers, steel mills, railroads and the like. 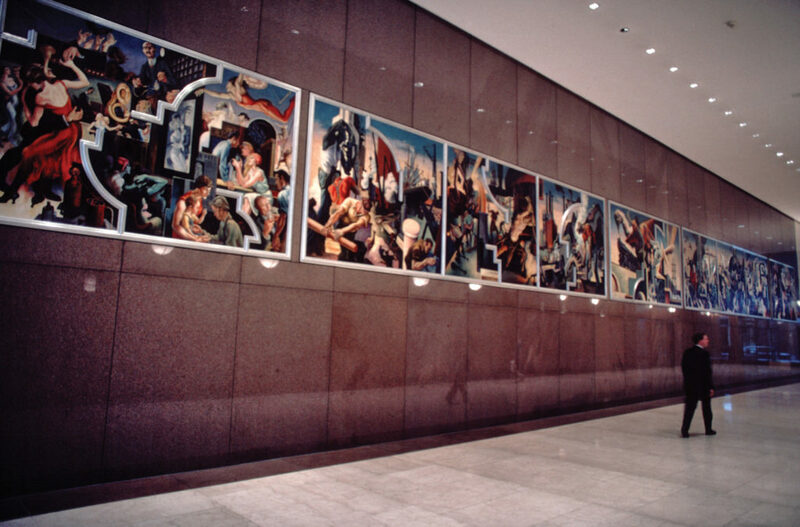 These became the basis for the mural, which opened to the public in 1931. It launched Benton’s career. Two years later, Pollock wrote to his father that Benton “is beginning to be recognized as the foremost American painter today. He has lifted art from the stuffy studio into the world and happenings about him, which has a common meaning to the masses.” Two years after that, in 1934, Benton appeared on the cover of Time magazine—the first artist ever to have that honor. Benton—who by then had abandoned the pretensions of his Paris days and adopted the persona of a gruff, hard-drinking Midwesterner—hated the elitism of the art world and its growing taste for abstraction. He wanted to create a distinctly American form of art that drew on the richness of the objective world and that would appeal to the common man and address universal themes. But despite his popular success, the guardians of high art rejected his work as sentimental and cartoonish. In 1935, at the height of his fame, Benton left New York to become the head of the painting department at the Kansas City Art Institute. 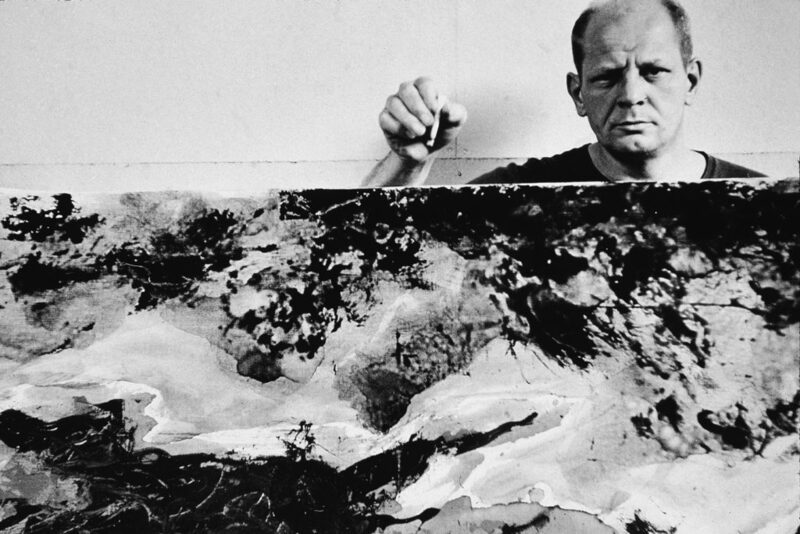 With his mentor gone, Pollock unraveled personally—he was an alcoholic and violent drunk—but he also began finding his own voice as an artist. 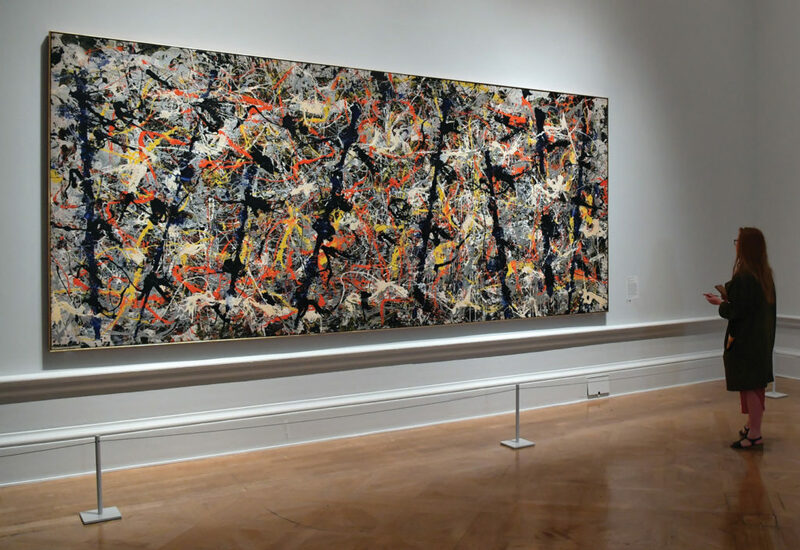 He started experimenting with abstraction and, in 1943, Peggy Guggenheim, gallery owner and champion of American modern art, gave Pollock his first major commission— the 160-square-foot modernist piece Mural. 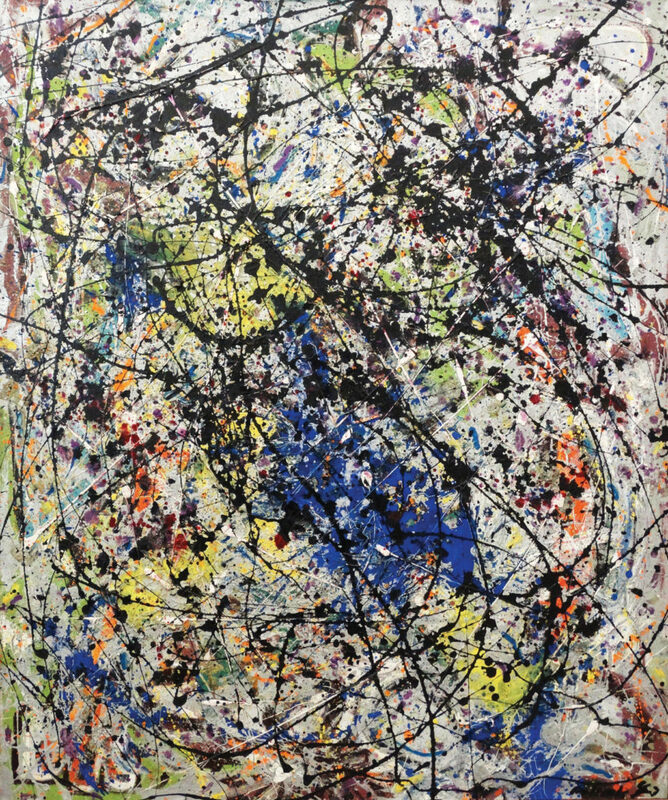 The art critic Clement Greenberg, who more than anyone else in this period popularized Pollock’s work, said that when he saw Pollock’s swirling, energetic composition, he knew that “Jackson was the greatest painter this country had produced.” And Pollock hadn’t even created his first drip painting yet. That would come in 1947. 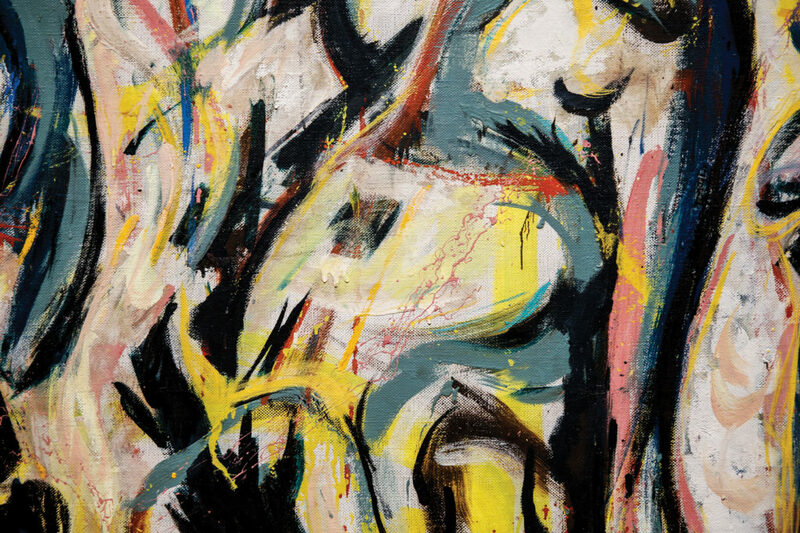 This detail of Mural, resembling a horse’s head, intimates Pollock’s original intent for the work. In the decade since Time had celebrated Benton’s representational paintings of America, the art scene had radically changed. Realism and American Regionalism had given way to the avant-garde and Abstract Expressionism, an American school of art that accomplished what Benton had originally set out to do: shift the center of gravity in the art world from Europe to America while creating a distinctly American artistic idiom. By then, Benton was considered a has-been and reactionary; Pollock represented the future of art. At the time, critics and fellow artists saw Pollock’s embrace of abstract art as a rejection of Benton. Pollock himself perpetuated that idea. When asked about Benton’s influence on his work in the 1940s, Pollock dismissed it as “something against which to react”—and said that the only thing that he learned from Benton was how to drink a fifth of whiskey a day. But the story is more complicated than that. The art historian Henry Adams points out that there was a deep connection between Benton’s representational work and Pollock’s abstractions—a connection Pollock himself privately admitted. In 1953, Tony Vaccaro shot this picture of Pollock in his studio in Springs, near East Hampton, New York, for an article in Look magazine that was never published. Benton also inspired the underlying patterns of Pollock’s works. In his book Tom and Jack: The Intertwined Lives of Thomas Hart Benton and Jackson Pollock, Adams points out that even though Pollock abandoned realism, his principles of design came straight out of Benton’s sketchbook. When Benton had been in Paris, he’d come under the influence of a group of modernist painters known as the Synchromists, who associated music with color. Although their work was primarily abstract, they found inspiration in Michelangelo’s depictions of the human body as a spiraling motif with muscular tension. A defining feature of Synchromist work is the organization of visual form in a similarly rhythmic, muscular pattern. Benton later renounced modern art, but he incorporated this Synchromist concept into his murals and teachings, and this principle, in turn, made its way into Pollock’s paintings. Even as Pollock and Benton criticized one another publicly, their friendship remained warm and intimate. Until he died, Pollock frequently called Benton and Rita late at night—often in a drunk but affectionate state. Emily Esfahani Smith is the author of The Power of Meaning: Finding Fulﬁ llment in a World Obsessed With Happiness. Her writing has appeared in The New Criterion, New York Times, The Atlantic and other publications. Visit her website for more information. This article first appeared in Artists Magazine. For art coverage, instruction and inspiration that never ends, confirm your subscription now. The legacies of both Thomas Hart Benton and Jackson Pollock are inextricably tied to painting powerfully, confidently and with an eye toward beauty in its broadest form. Learn the foundation of painting behind all of those with Patti Mollica’s How to Paint Fast, Loose and Bold. Powerful compositions, no matter the subject matter you choose, will be the result.